It’s only natural that once summer arrives, my mind drifts toward the beach and the ocean. The sights and sounds of families enjoying time together, the salty smell of the ocean, the warm breezes, the seafood, the laid back attitude…ahhhh…there’s nothing like it. I can’t be at the beach 24/7, but I can certainly feel like I am by adding a few coastal touches to my summer decor. 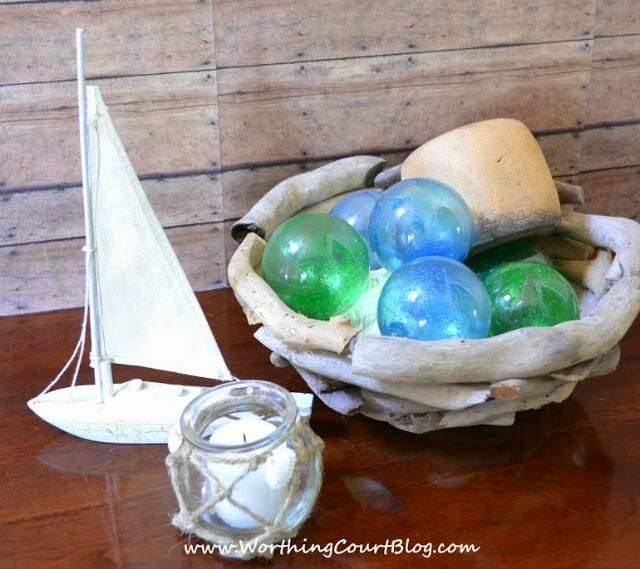 A driftwood bowl filled with glass fishing floats coupled with a cork fishing float is just the right beachy touch that I need. These little guys are so easy to make that it’s scary. I enlisted the help of my granddaughter, Miss M. We had such a good time making these together. 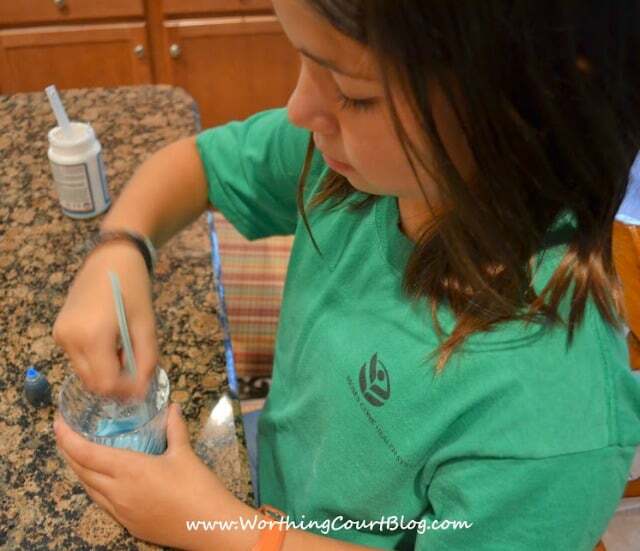 Simply mix together some ModPodge and blue or green food coloring in separate containers. Add a few drops of food coloring at a time until you get the shade that you desire. Keep in mind that the mixture will turn darker and transparent once it dries. 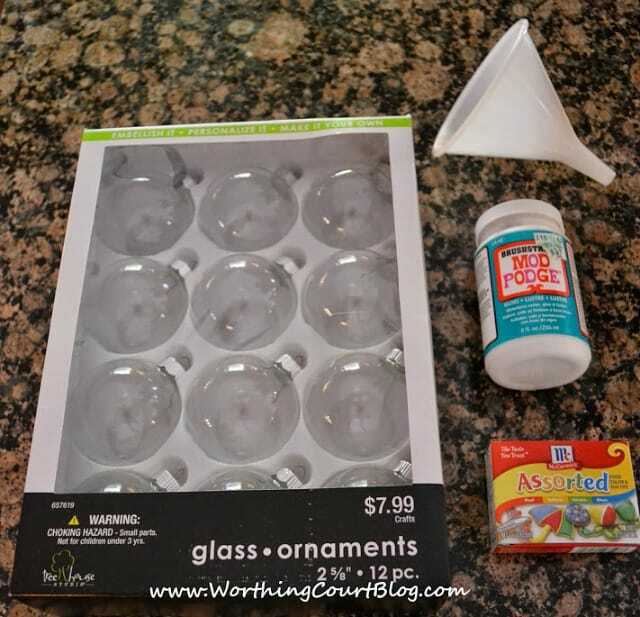 Use the funnel to pour some of the mixture into a glass ornament. Swirl the ornament around until it is completely coated on the inside. Place the ornament back into the package tray to dry. Make sure it is upside down so that any of the excess Mod Podge mixture can run out. I’ll warn you that it does take a pretty good while for them to dry. Some of mine dried faster (and became darker and transparent) than others. The thinner the mix of ModPodge and food coloring, the faster they will dry. The hardest part was waiting for them to dry! I love this idea and I happen to have everything I need to make some for my own home. My niece and I will have fun making these very soon! I love your project Suzy! I have an empty dough bowl that’s waiting for something summery to land in it! Great project to do when the grand girls are here! Suzy, These are great. Love the colors and seems like an easy project. Have to try it! What a fun project and so pretty in a basket. Off to see more tours. This is so cute, Suzy, and what fun that you shared it with your granddaughter. 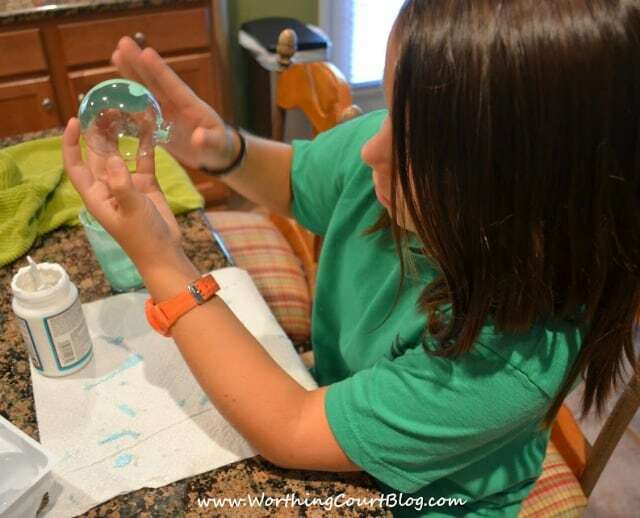 I’ve always tried to encourage my kids to be crafty and find what interests them. We used to have a recycling tub that was just for the kids to go find something to make. My son Joshua would make a car or a computer or whatever. The girls would make something pretty, of course! If they were ever bored I sent them to the tub! Suzy, what a perfect Summer time craft. I love the finished look and the best part is the kids can get in on the fun! Really pretty! And I have plenty of Christmas ornaments dreaming of their day in the summer. Love this idea, Suzy!! I think I have some clear ornaments in a container of Christmas stuff in my attic… may have to pull them out for this one! Great project for kids, too! I have no idea what glass fishing flats are (hanging head in shame) but these are so pretty even if they are just to look at! I love this idea! I have looked at the real thing in stores, but never wanted to pay the price- this is right up my alley. Thanks! So pretty Suzy!!! Love this idea!! 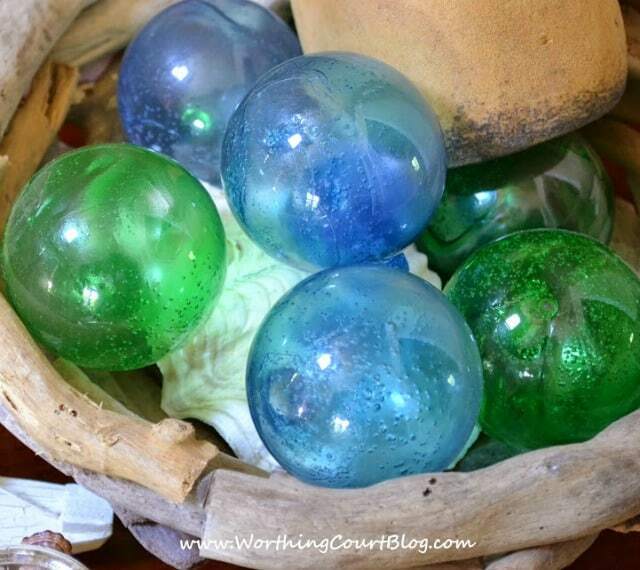 suzy- i just love this idea to create your own floats. It screams summer. Wow – you started us off with a bang! I love, love, love this project and plan to do it soon for my back porch! Thanks for sharing with us Suzy! Those turned out great!! I’m so glad to be on the tour with you! I was thinking, “Oh where did you get these?” and then I see you made them!! I seriously have to try these. They’re so pretty! OH MY GOODNESS! These are brilliant! The real ones are so so expensive and yours are so easy to make… and they look like the real deal. Thanks so much for this great idea. Pinning and featuring you on my fb page! I love these Suzy! What an awesome idea, looks so fun and easy to make too. A perfect summer project to do with the kids! I love these fishing floats! I have wanted some for a long time but they are usually pretty pricey. I am going to have to try out your tutorial asap! These are unbelievable! They look so pretty–just the right touch of summer! I’m pinning this, and I’m going to hunt for some clear glass ornaments to make some for myself! Wow, they really look like real floats. So cool! You can always put the hanging ring back in and use them for Christmas ornaments. Suzy, I love this idea! Fishing floats are favorites of mine and I love how yours turned out. Thanks for the inspiration! This is such a great project…I can’t wait to try it! Thanks for sharing! What a great idea! I love the colors you chose! 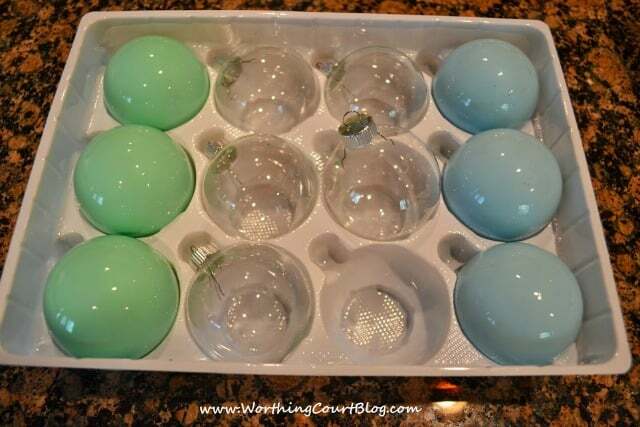 Such a smart way to upcycle those old ornaments! Wow! This is ingenious!! Thanks so much for sharing! So smart and so pretty! Do they dry clear? The ones you show drying look solid. I like the clearer look. Hi Ann. They dry clear, but with color. They aren’t frosted at all, if that’s what you’re concerned about. If you prefer more subtle color, just use less food coloring with the ModPodge. Hope I’m answering your question! 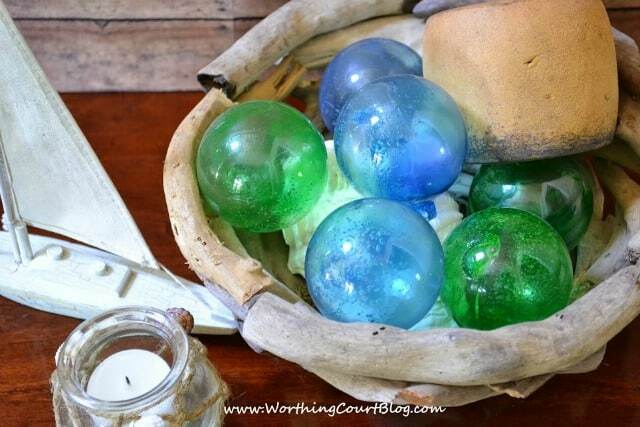 Suzy, How do you create the glass fishing balls without breaking them? Glass Christmas ornaments are so fragile. I would think when you pull a knot tight, it would break the ornament. I have some glass orbs that I purchased years ago at Kirkland’s and two have a surrounding decoration that has come unglued. They are heavy glass, and they would be perfect (I think! )for this project. I did buy a tube of E6000 glue to glue those decorative parts back on them. Thanks for sharing all the projects you have done. Lots of inspiration there. Hi Betty. Can you tell me what you’re referring to when you mentioned pulling a knot tight? How long did it take for these to dry? Hi Sarah. The first time that I made them, I made the ModPodge mixture too thick and it took them quite a while to dry. The next time, I make a thinner mixture and they were completely dry after several days. I was wondering what kind of modge podge are you using? Hi Jamie. I just grabbed what I happened to already have. It was actually pretty old, but worked fine. I think any type will work! I noticed you said you made your modge podge mixture thinner. Did you mix the modge podge with water and food coloring? I just thinned the Mod Podge with food coloring, however when I make these again I think I’ll thin it down more with a little water so that they’ll dry quicker. Love this! I now have Hobby Lobby on my errand list. Thanks for the inspiration. I’ve tried coloring the clear ornaments and found there was something not quite right so I did some more experimentation and here’s what I found that is beautiful. FYI: I mixed all the paints and water in 35mm film canisters. is made it easier to mix so I didn’t waist paint. For the painted balls: before I used the colored paint, I coated the inside with 3 coats of pearl paint thinned a bit with water. Then I used the colored paint (thinned with water). This gave the balls a more depth like a mirrored ball and the pearl paint softened the color just slightly. Then I wanted the clear floats to be clear, not frosted. Modpodge tends to make things look cloudy and I wanted the floats to be clear, but colored. So, I added about 10+ drops of food color to gloss varnish and poured that in the clear ball. After 3-4 coats the balls are the exact color I want and they are perfectly clear, just like real floats. I hope this helps any other “perfectionists” like me. I wonder if the colors fade, if the balls are in a basket in a sunny place in the house. I love the idea. Hi Mary. I can’t say for sure how they would react if left in the sun every day for a long period of time. I’ve only displayed mine during the summer and for a few weeks at a time. I can say though, that mine are still as vibrant as the day I made them, which was four years ago!